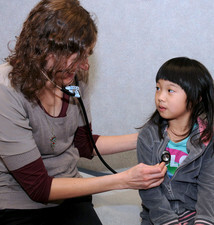 We are sorry to hear your child is sick and are here to help you best care for your child! For children who are sick, we offer walk-in hours every morning, Mondays through Saturdays, from 8:30-9:00am. We also accept same-day appointments. Please call our office at (847) 674-4730 to schedule an appointment if you would like to come in after 9:00am. We also offer a 24-hour answering service, 365 days a year if you have a concern that needs to be addressed outside of our regular business hours. Simply call our main office number at (847) 674-4730 and our answering service will contact our physician on call. The physician will then call you back promptly. (Please keep in mind that our physicians will be paged at their homes, so kindly only use our after hour service for urgencies that cannot wait until the morning, especially for calls after 8pm). **For true emergencies, dial 911 immediately. We also encourage you to review the common conditions we have listed on the left. Simply click on a link and read our answers to some questions and concerns about these common conditions. You'll also find dosing charts on how much of each medication you can give your child at each age and our recommended pediatric resources.